It's only been about a week since we were wearing winter coats and wool sweaters in New York. Winter weather seemed interminable, and temperatures lingered in the forties throughout most of April (uggghhhh). An upside to this is that our citrus supply seems to be happily lingering as well. We still find oranges and clementines and tangerines, lots of various citrus fruits in the markets. And so, with this abundance, and with a sunny, springy outlook now that May is here, I created an Italian-inspired (specifically Sicilian-inspired) olive oil cake with plenty of citrus zest in the batter -- even a little juice -- and of course, top-quality Italian extra virgin olive oil. The frosting is my favorite kind, of course: cream cheese. 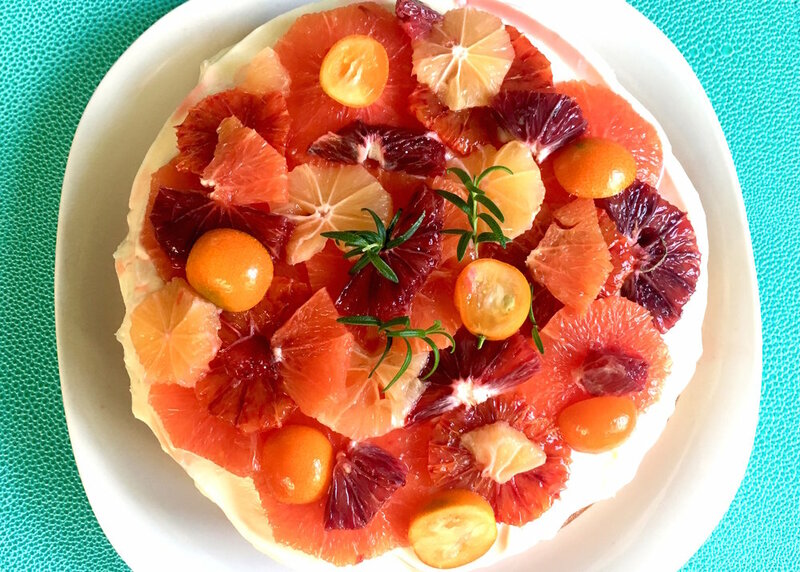 The tangy zip of this topping holds its own against the acidic zing of the citrus cake itself, and pairs wonderfully with the fresh citrus fruit I arrange on top of the cake, both for fresh citrus flavor and for gorgeous added aesthetic appeal. There's even a touch of fresh rosemary in the batter, so I've garnished the top with some sprigs as well (rosemary pairs so well with citrus). The additional good news for the gluten-averse? I made this cake with only a touch of AP flour, which is optional, because the bulk of the dry ingredients here is comprised of almond flour. This provides for a very tender crumb and super-moist cake with a golden, almost crunchy shell. It's a pretty fabulous recipe, if I do say so myself. My husband, the healthy trainer with a sweet tooth, loved it -- and finished this one off even more quickly than usual! 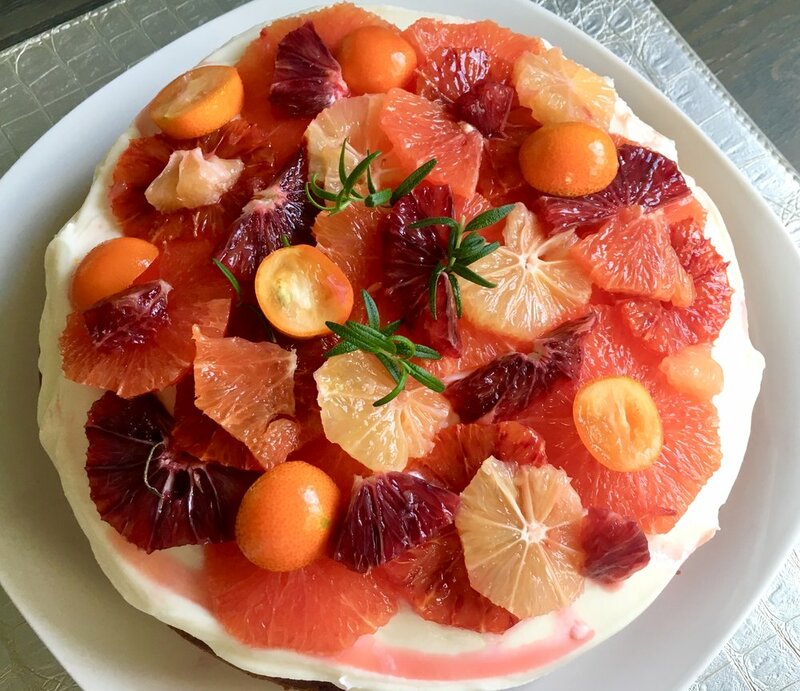 I hope this cake brings a little Sicilian sunshine into your kitchen -- and I'd love to hear about your modifications, if you make any, in the comments section. Enjoy! 3 oranges: blood, cara cara, etc. - Grate zest of 2 oranges and mix into the sugar in a bowl, with your fingers to distribute evenly. - Supreme 2 oranges: cut off the bottom and top and run a knife along the rounded shape of the fruit to remove the peel and pith (white part). Cut the orange segments from between the connective membrane and collect with juice in a bowl. Tear segments into bite-size pieces. - Halve the 3rd orange and squeeze the juice into a measuring cup. Add the yogurt to reach 2/3 cup total. Pour this liquid mixture in the bowl with the sugar, and mix. - Add the 3 eggs to the sugar-liquid. - In a medium bowl, whisk together the flour, baking powder and soda, and salt. Whisk these dry ingredients into the bowl with the wet ingredients in 2 batches. Fold in orange segments and the diced rosemary. - Whisk in the olive oil into the batter until it comes together and is mixed thoroughly. - Pour batter into the pan and smooth the top. Bake for about 50 - 60 minutes, and test for doneness after 50. The top should be golden brown and almost crusty, and a toothpick inserted into the center should come out clean. - Cool to room temperature. Move to a cake plate. - To make the frosting, soften the cream cheese to room temperature. Beat with a hand mixer or a stand mixer until the cream cheese is light and airy. Add the confectioner's sugar, 1/2 cup at a time, until desired tangy-sweetness. You can add a touch of orange juice or zest for sweetness, if you like. - Frost the cake and place the rounds of fresh citrus on top to decorate, along with fresh rosemary sprigs.